Overall Print Size: 27¾" x 20¼"
"The 4th Fighter Wing heritage originated in 1940 with the American volunteers who formed the Royal Air Force Eagle Squadrons. Their Spitfires took to the skies through the dedication of the maintainers whose descendants today sustain four squadrons of multi-role F-15E Strike Eagles as members of the 4th Maintenance Group. The Eagle Squadrons became the 4th Fighter Group and by the end of World War II had destroyed 1,016 German planes - thus began the legend of “Fourth But First.” Maintainers, like the famous nose artist and crew chief, SSgt Don Allen, kept Spitfires, P-47 Thunderbolts, and P-51 Mustangs flying despite countless missions. Korean War maintainers suffered freezing cold to ensure their F-86 Sabres were fully mission capable, enabling aircrews to destroy more MiGs than the rest of the Air Force combined. In Vietnam 4th Tactical Fighter Wing maintainers labored to keep their F-105s and F-4 Phantoms in the fight. Through Operations DESERT STORM, IRAQI FREEDOM, and ENDURING FREEDOM the men and women of the 4th Maintenance Group continue to generate, launch, recover, and regenerate aircraft 24/7, 365, anytime, anywhere in the world. “Fourth But First” is not just a slogan – it’s a way of life." To the far left of the text is an image of the 4th Maintenance Group emblem. To the far right of the text is an image of the nose art Don Allen painted on the P-47 flown by Lt. Aubrey Stanhope of the 335th Flying Squadron, 4th Fighter Group. Between these two images are the patches of the four 4th Fighter Wing Air Maintenance Units (AMUs). "EAGLE LEGACY" is a celebration of the 4th Fighter Wing heritage from the RAF Eagle Squadrons. Each print in the edition is individually signed and numbered by the extraordinary artist Ronald Wong who is well known for his beautiful and historically accurate depictions of modern US Air Force and Royal Air Force squadrons and wings. 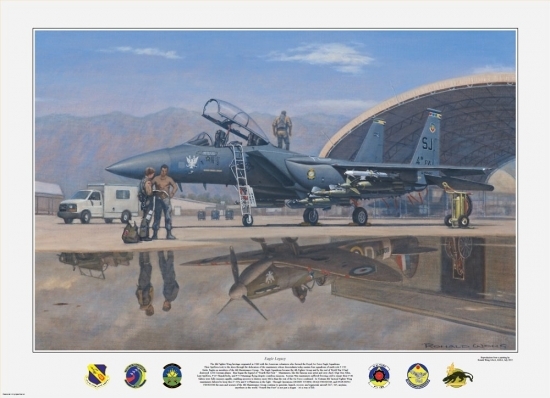 This is Wong’s second print for the famous 4th Fighter Wing and his first to feature maintainers. Each print in the edition is also individually signed by Colonel THOMAS EISENHAUER, former 4th Maintenance Group Commander, who commissioned Wong to paint this amazing image. Comes with a photograph of Colonel EISENHAUER taken as he was signing the prints.